I’m back! And it only took the statutory holiday for me to get started again! I’ve been looking forward to this mid-week break for a while – my plans were : go to the gym, bake, and cook. And I managed to accomplish two out of the three. Ooh – and watch tennis! So three out of four, really. Although I did miss the Federer match, I watched a good chunk of grass-court action. I didn’t “cook” exactly, but the mothership was in the mood to go out to eat. The feature recipe of this post is the lovely cranberry coffee cake! I didn’t want to make a full portion of the recipe, so I halved it and used my luuuurvely Chicago Metallic mini-cheesecake pan. It’s like a muffin tin, but the cavities are deeper and narrower, with a 1/2″ hole in the bottom (you get metal slips to put in the bottom for easy cheesecake removal). In the move, I forgot the metal slips, so I used parchment rounds instead. Put sugar and vanilla in a food processor and pulse to combine. Pulse cranberries and 1/2 cup of the vanilla sugar until finely chopped. Whisk 2 cups of flour, baking powder, and salt. Beat together 1 stick of butter and 1 cup of vanilla sugar until pale and fluffy. Add eggs, mix to combine, scraping down bowl. Add in flour and milk alternately. 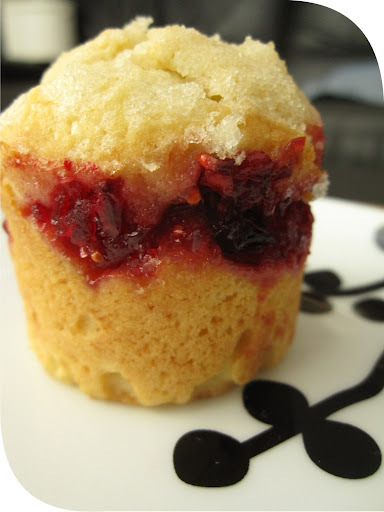 Spread half of batter in pan/tin, add cranberry filling and top with remaining batter. Smooth tops. Blend remaining sugar with the tablespoon of butter and flour to great a crumble (oops, I forgot the flour – eh, still good without) and sprinkle liberally over cake(s). Bake for 40-45 min (for whole cake, approx 20 min for mini cakes). As you can see, I did not use cupcake liners (wouldn’t fit anyway) and didn’t leave a border – look at that gorgeous ribbon! It’s all about the presentation, baby.